Learn to clean and repair your pinball machine. Pinball machines need maintenance. If you have bought a dirty, used pinball machine, you can learn to clean it yourself. Polish and clean parts, repaint worn areas, and you can make your pinball machine look and play (almost) as brand new again. How to make ramps and plastics as new.. at your own risk ! When flamepolishing goes wrong.. you fix it. Polish and clean metals parts without doing everything by hand. How to 'shop': clean and restore a pinball machine - introduction. Part 1, remove parts from the playfield. Part 3, clean and restore a playfield. Part 4, assemble and adjust. How to repair a broken volcano on your Congo pinball machine. 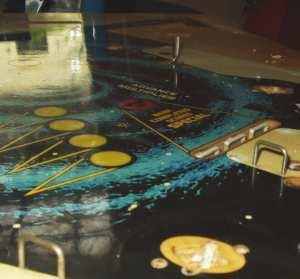 Information about waxing your pinball playfield. Detecting problems with optos in the ball trough, especially on WMS games that use 6 pinballs. Mansion decal installation on an Addams Family playfield. An easy way to solve switch matrix problems on WPC pinball games. How to make an adaptor for the service plug on WPC games. How to connect a Stern TOPS system in Europe. How to disassemble the clock of your Twilight Zone pinball machine. What is it and how to repair the lights on your pinball machine ? Give your old fridge or other kitchen appliance a new color. Install a new DMD protective plastic on WPC-95. Install the optional VSU-100 speech pcb in Stern Orbitor One pinball game. How Magic Tokens are recognised on Ballys Safe Cracker. How to build a brace to make a sagged playfield even again..
How to touchup and clearcoat playfield damage with an airbrush..
A playfield tipper is a good tool when you often work on pinball playfields.. Perfectly clean plastic and metal parts with an ultrasonic cleaner. You need to have this machine when you want to clean a pinball machine in detail. Make your own 3D pinball parts such as Cactus Canyon mountain and guns. New speakers and a change of a resistor will give your pinball machine a lot of bass and improve the sound quality. Power mods from the service switch and power them on/off together with the game. Replace a broken DMD with an LCD screen and set it in color.